18 “Which ones?” the man asked. 22 But when the young man heard this, he went away sad, for he had many possessions. 25 The disciples were astounded. “Then who in the world can be saved?” they asked. 28 Jesus replied, “I assure you that when the world is made new and the Son of Man sits upon his glorious throne, you who have been my followers will also sit on twelve thrones, judging the twelve tribes of Israel. 29 And everyone who has given up houses or brothers or sisters or father or mother or children or property, for my sake, will receive a hundred times as much in return and will inherit eternal life. 30 But many who are the greatest now will be least important then, and those who seem least important now will be the greatest then. If you have been following our read through the Gospels, you will probably have noticed that I like the art of Vincent van Gogh (almost as much as my daughter does). To love van Gogh’s art is to love the man himself, his art and person were so intertwined (as it is with all great artists). One of the things I find most endearing was Vincent’s way of doing all things to the fullest. When he served as a pastor to a poor mining town, he spent his time down in the mines and in the small peasant homes of his flock. Devoted to his brother Theo and to his friends, Vincent’s love knew no partiality. You can see this in his paintings, which are so three dimensional, the paint applied so thickly, they are as much sculptures – works of texture – as they are paint on canvas. 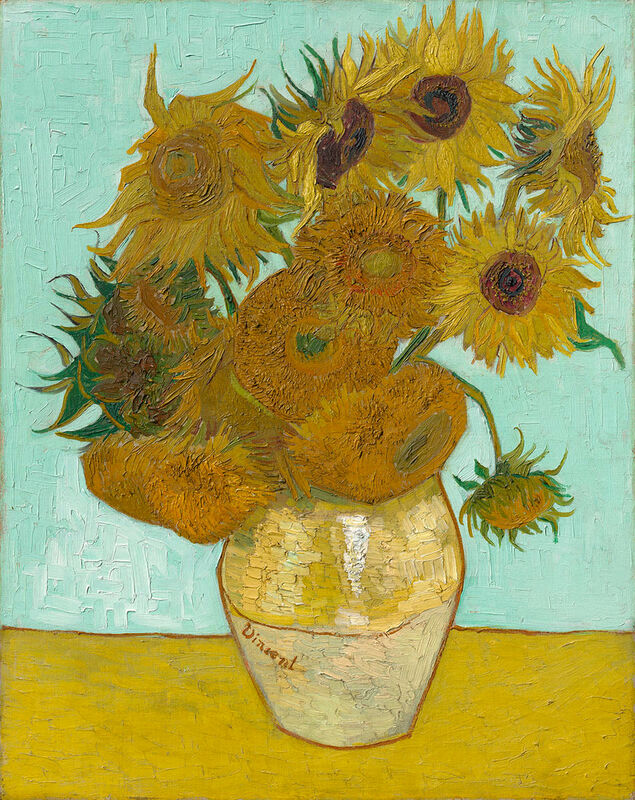 This is perhaps most true of his Sunflowers, which he painted for his friend (and fellow painter) Paul Gauguin to celebrate his coming to live with Vincent. Vincent used a considerable amount of yellow paint, so much that Gauguin was astonished by it. Those paintings hung in Gauguin’s room, and though he only stayed for nine weeks, the memory of them remained with him years afterward. This, I think, is the difference between what the man had been doing and what Jesus offers him. He had been keeping the basic commandments, not murdering, stealing, committing adultery or perjury. Those are good commandments to keep, just like using a little bit of paint to create a basic image is good. Both are nice. But Jesus offers him (and us) the opportunity to make something that is much more than nice, to create something that will change lives forever, to leave an impact far beyond our brief years. Vincent van Gogh didn’t just paint pictures, he poured his entire life, all his love, all his being, all he had, into works of art that still move us today. They move us to love, to think, to feel, to drink life deeply. This is what Jesus offer us. The chance to make of our lives what van Gogh made of his art. We can play nice with the basics, or we can give everything we have, all we are, all our hopes, all our dreams, all our love, all our existence into following Jesus. The impact we will have is beyond anything we could ever have to sell or give up. The joy we will experience is so far beyond any other pleasure this life could possibly offer.